Little tea spoons I've collected over the years . . . on vacation and at tea shops. There are also several heirloom spoons in this collection.
. . . the baby fork and the baby spoon to the left of it was a baptism gift to one of my children. This was my great-grandmother's baby spoon. It has a script "A" on the back for her last name Ames. I have an arrangement of plates on the wall near my kitchen table that I switch out according to season. I was so happy to find six of these plates for a dollar each at a consignment store. They are perfect for my autumn/Thanksgiving arrangement. There are three different designs, and although a couple of them are showing their age, I still love them. 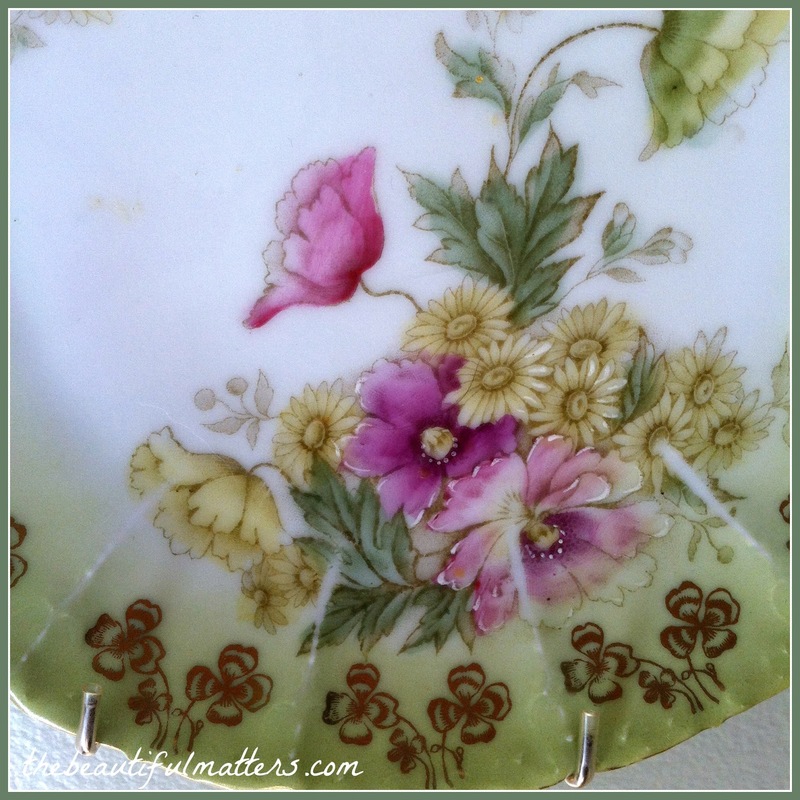 Four of them are on the wall with a Limoges dinner plate and four of these plates from my husband's grandmother . . . I think the olive greens of the two patterns go really well together. I also found the white dishes below at the same consignment shop. Six dinner plates, six salad plates, and six coffee mugs. We are having overnight guests over both Thanksgiving and Christmas, and I thought these could supplement our every day white dishes since I only have service for eight. 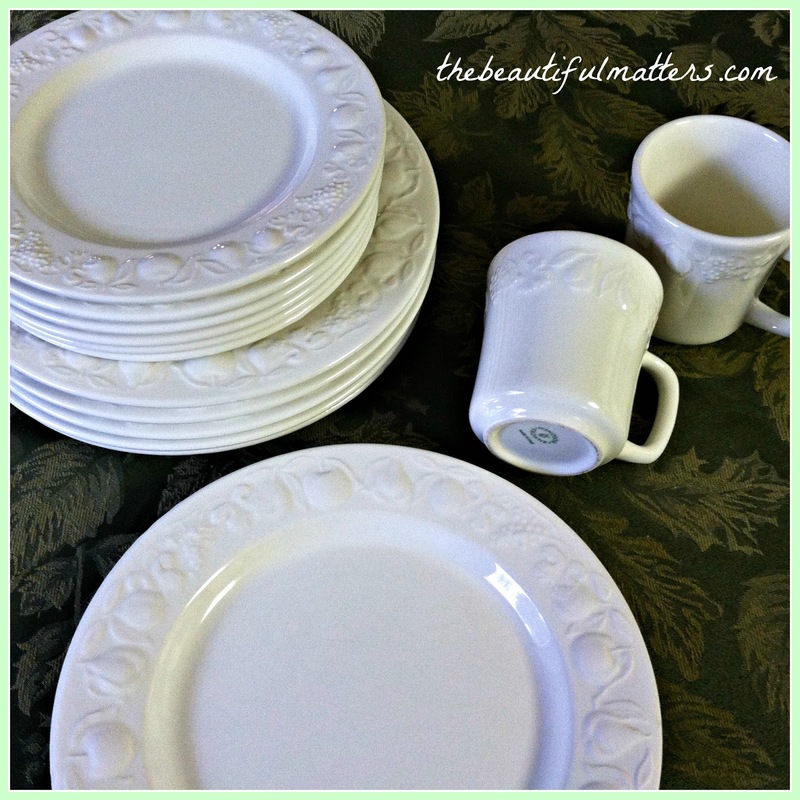 I have lots of vintage china that we will use for our holiday dinners, but these will work for breakfasts and sandwiches/snacks. My youngest son will probably also appreciate having enough every day dishes on hand so that he doesn't have to hand his college buddies a frou-frou flowery plate to have snacks on during a football game! I really didn't need the extra mugs, but they came with the set. Now they're my favorite, as they have a very comfortable handle. I like the raised fruit detail on these. So I am having a "mugga" rather than a cuppa today. Is that a word? With my tea I'm enjoying a little cupcake pulled from the freezer earlier today. Small blessings that make me happy. Joining with Sandi for Teatime Tuesday. ...hope you had a great weekend. I love your collection of little spoons specially the heirloom one from your great-grand, wow! I have a small collection too with heirlooms and from trips. The plates are stunning and a lovely collection as well and perfect to show them off in your wall. The 'mugga' sounds good and they're so pretty too. 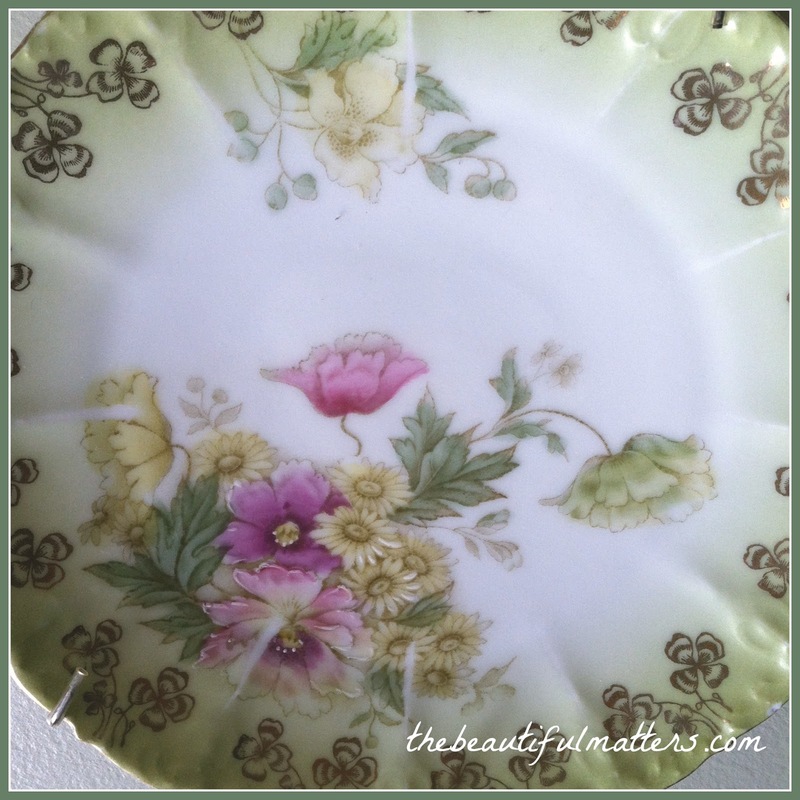 Hi Deborah: The vintage plates are very pretty. I'd love to see them up on your wall sometime. I love collecting beautiful dishes, too. I especially love the blue and white English china. I have a collection of vintage tea-spoons, too. They are fun to look through at thrift shops. That's amazing that you have a great-grandmother's spoon. What a treasure that is. It's very cold and snowy here in Ontario, Canada. Time to get out the winter boots. Enjoy your evening. Hugs, Deb. I love your collection of spoons and your pretty thrifted and heirloom plates. The white embossed set will always be in style and a welcome addition to your busy kitchen. Sounds like your planning for all your Thanksgiving guests. 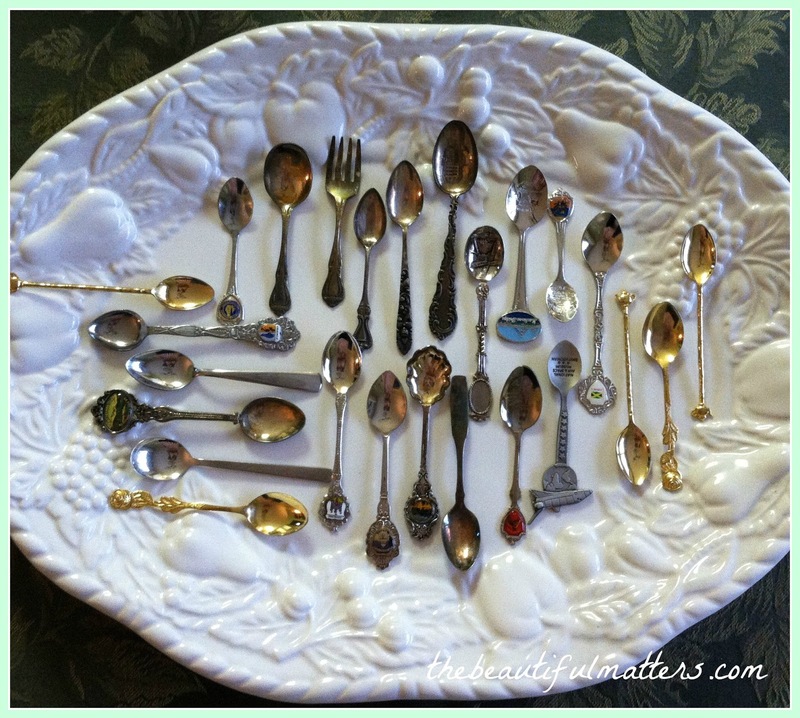 Lovely little spoons and family treasures that are enjoyed. Your classic white dishes were a great find. I love white with green and red linens at Christmas time. You scored some lovely china wear and that is really handy for use when you have a large crowd. Love your tea spoon collection and also your great-Grandmother's citrus spoon. The arrangement of spoons and fork on the platter really appeals to me. You found some wonderful dishes and that they will complement what you already have is a huge bonus. This is the fun kind of gathering in. Hi Deborah, I love the spoon collection and the light green plates are so pretty. 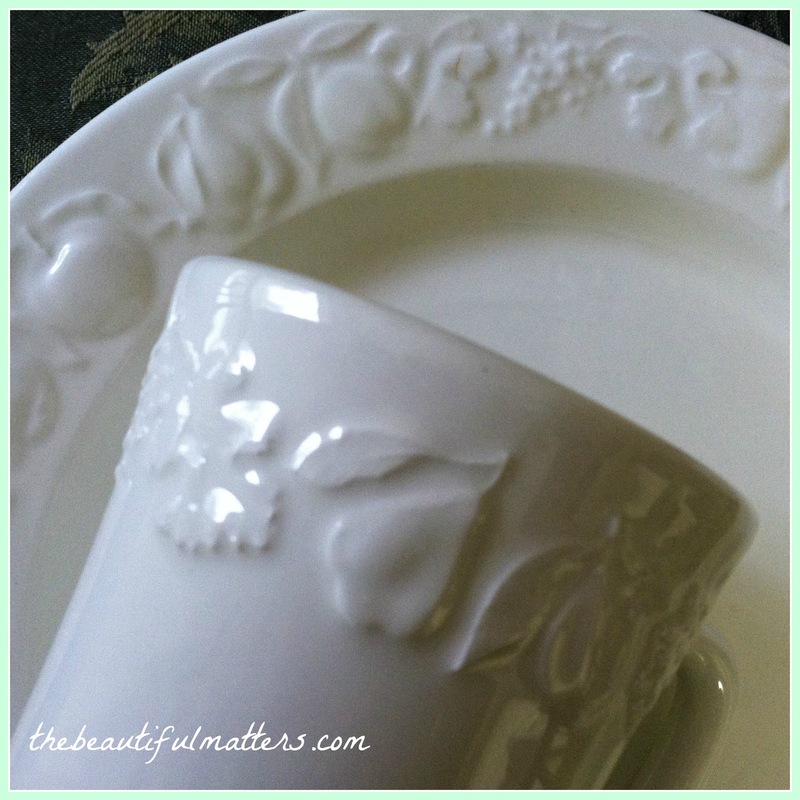 I really love the white china you bought at the consignment shop. Sounds like you will have a busy house for the holidays. At least you will entertaining in style. Have a nice day. Your spoon collection was a real delight and the collection of china will be a real asset over the holidays. Your little spoon collection is so special. Nice to have memories connected to so many of them. 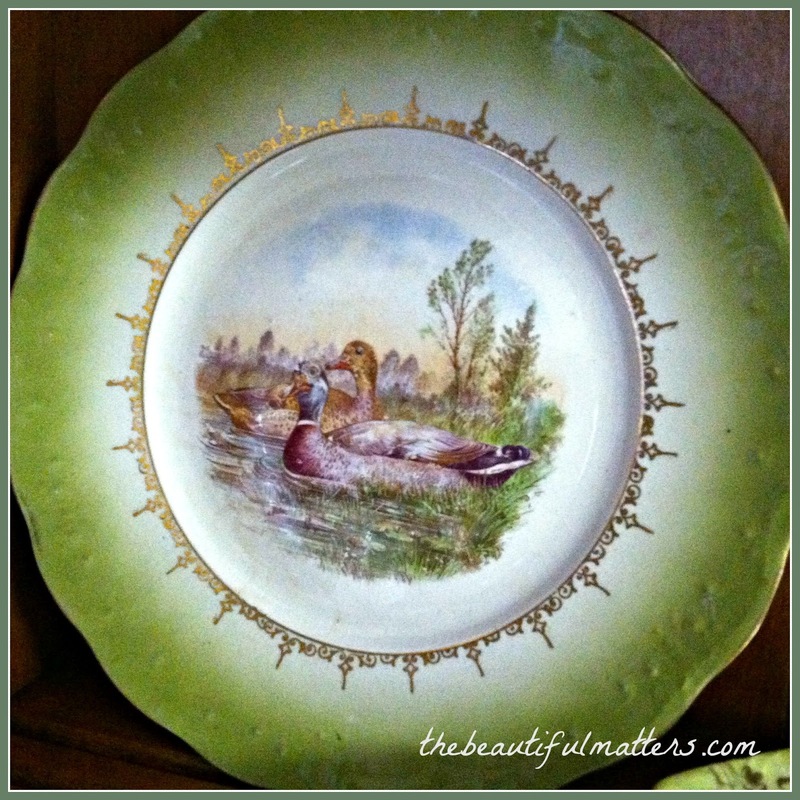 AND those plates you just found at the consignment shop are lovely. Deborah, what a fun post today! I enjoyed looking at all your collections and I love your white dishes with the raised fruit motif. I like a mug too with a comfy handle. They often become favourites for tea and coffee when I'm not using a china cup. You have a fabulous spoon collection. Thanks for sharing and joining me for tea. Have a lovely day. Thanks for sharing your collection of spoons. What fun treasures. I also love your plates. They are perfect for Thanksgiving display. I love the raised fruit on the white dishes too. I am a real dish-aholic! Wishing you a delightful afternoon. your first photo make me gasp with pleasure...so attractive! those dishes are lovely as well; have a blessed Thanksgiving. You have a great collection of teaspoons Deborah! I love that set of white dishes at the end of the post too. 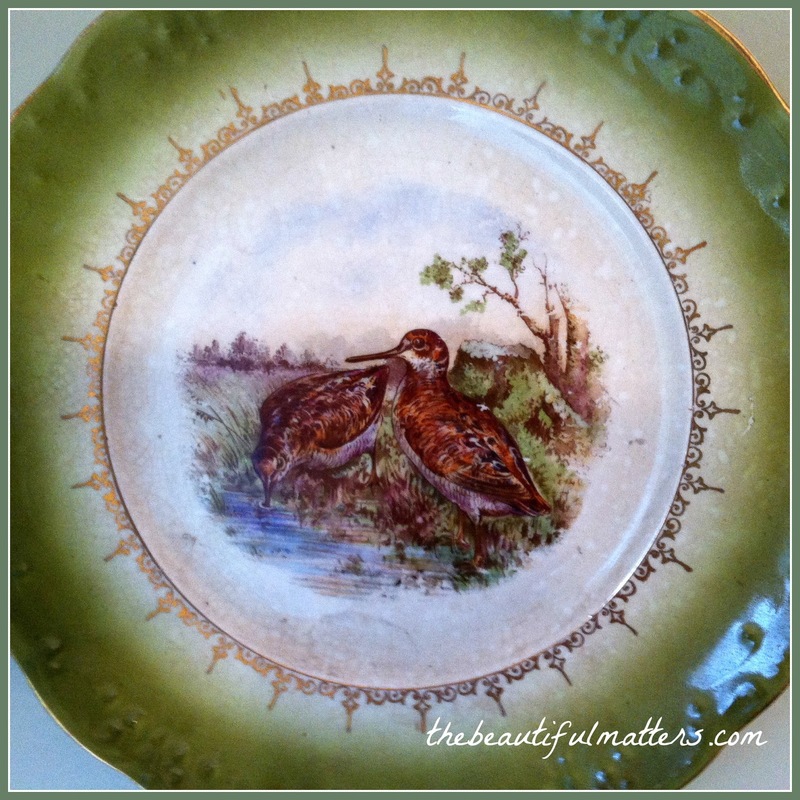 Hi Deborah, Love the plates you found at the consignment shop. The colors do look so pretty together. The white fruit plates and mugs are wonderful. I love them and they seem to go with your large platter design too. Perfect to have on hand for company over the holidays. The spoons are darling. I collect spoons to paint and transform into ornaments etc. Lately I love finding the smaller styles and sugar spoons. I love your white set of dishes. The nice thing about having a lot of white dishes is that even if they are mismatched, they all go well. I actually prefer a lot of white dishes mismatched. I can also see why the mugs are so appealing. I bought a similarly shaped mug at a dollar store and find myself reaching for it every morning to sip my coffee from. The mug is not too light, not too heavy..it is just right ! I have lots of little teaspoons too...and picked them up as souvenirs. They are so fun! That's a great set of dishes...so versatile! I've seen the white dishes with the fruit before but cannot remember where, a friend must have them and they really are pretty and versatile. I'm glad you use your little spoons, often they're on a display rack in someone's home who complains about cleaning them. It's nice if they have a story of how you came across it or who might have gifted you with one. 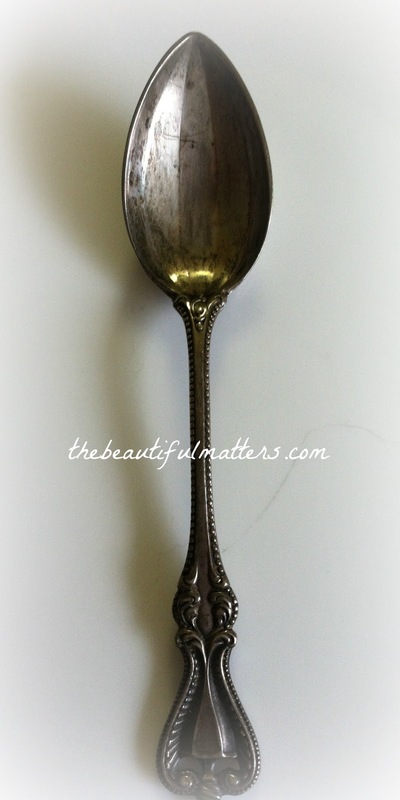 Your great grandmother's baby spoon! What a treasure that is! I don't collect spoons, but I seem to have quite a few that came from others in the family. Maybe an accidental collection. :-) These are lovely. Those are very pretty! Isn't it interesting how various cups and mugs has such different handles? And some are oh-so comfortable, and some are NOT at all? You'd think the designers would try them out to be sure they would appeal to the drinker :) Good find, Debbie!